Beautiful spring weather has finally arrived in the Hoosier state. 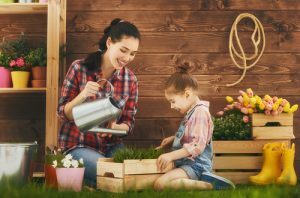 That means it’s time to get the kids moving again—and one of the best ways to do that is by helping them cultivate a love of gardening. Yes, we might be a little biased. But we think you’d be hard pressed to find a hobby that offers more for you and your family—especially if you’re sticking around the house for spring break. Not only does gardening allow you to spend time together enjoying the Great Outdoors, it also teaches your kids responsibility, patience, the value of hard work, delayed gratification, and is proven to promote good health. That all sounds great, but what if your kids don’t seem interested? We have some ideas for that—six to be exact. Check them out below! Let the kids do the planning. It’s a simple fact of life: most kids don’t like being told what to do. When it comes to gardening, that’s not a problem—although you’ll want to provide guidance and encouragement along the way. Get your kids involved with garden planning from the start, letting them make decisions about what and where to plant. This will help them take pride in the garden, and it’ll teach them responsibility even if they don’t realize it. Find their own space. You can plant a garden almost anywhere, and it doesn’t need to be large. Many gardens can be as little as 3’ x 3’ or even smaller. If you already have a decent-sized garden, you can designate a certain part of it as your kids’ section. This is a great option because you can lead by example, showing them what to do and allowing them to practice in their own area. Buy or give them gardening tools. Buying your kids their own tools is one of the best ways to get them interested in all that gardening has to offer. If you don’t want to get a whole tool set, you can start with a pair of children’s gardening gloves. Or you could hand them down your old gardening tools, and get some new ones for yourself. Either way, it’s a win-win. Grow edible plants. When growing edible plants in Indiana, you have a ton of options—everything from tomatoes to watermelons to many kinds of herbs. Lots of kids will love the idea of eating fresh produce they helped grow, and they’ll probably also enjoy picking and preparing it as well. As a side benefit, you might get them started with a love of cooking, too! Invite the birds. It’s not a bad idea to consider getting a few birdfeeders or a bird bath if you have the space. These will attract beautiful birds to your garden and will help keep kids interested in what’s going on outside. You might even get some hummingbirds to show up if you have the right kind of feeder. Watch nature shows. Even the most dedicated gardeners need a break every once in a while. When you’re relaxing and watching TV with the kids, consider turning on a nature show. Even if it’s not about gardening, anything related to plants and animals will help spark their curiosity about the natural world. And that bodes well for keeping a gardening hobby going. 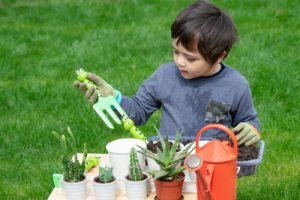 If you’re looking for a way to keep your kids busy while they’re at home this spring, gardening might be the right answer. It can be a rewarding activity for children as young as four or five years old, and in many cases, remains a lifelong hobby. And regardless of age, getting your kids off the couch and out into nature is always a good thing. Gardening is especially important to us at Engledow because we have a serious passion for plants. If you’re ever looking for help with landscape maintenance at your home or business, landscape design, or are just interested in some beautiful flowers, trees, and shrubs, we’re the team to call. Contact us today to learn more. This entry was posted in At Home and tagged Featured by Eric Engledow. Bookmark this link. Creating a Landscaping Budget for Next Year? Here Are a Few Things to Think About. Looking for Groundcover Alternatives to Grass? Here Are Some Ideas.